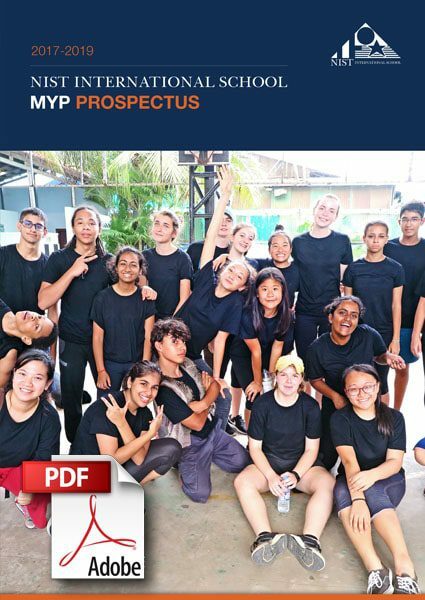 The creative, dynamic energy of adolescence is focused in the Middle Years Programme (MYP) at NIST as students from 11 to 16 (Year 7 to Year 11) begin to connect what they experience in the classroom in a real-life context. The MYP aims to broaden perspectives, encouraging youth to communicate and collaborate with those of different cultures and backgrounds, and critically assess their choices and the world around them. In the MYP developing social and emotional skills plays a role just as important as the broad academic subjects, and a strong focus on community service encourages adolescents to empower others through shared experiences. This well-rounded approach culminates in a self-selected personal project that ties together their learning and taps into their personal passions. The MYP builds on the knowledge, skills and attitudes developed in the PYP and prepares students for the rigor and requirements of the DP. As a broad curriculum framework, the MYP requires all students to study eight distinct subject areas: individuals and societies, language and literature, language acquisition, mathematics, design, arts, sciences, and physical and health education. The MYP framework emphasizes learning in authentic contexts, building and deepening conceptual understandings, and developing skills that enable students to learn and thrive in our world. Students who participate in the MYP build confidence, learn by doing and connecting to the larger world, develop an understanding of global challenges, and act as responsible citizens. Service learning plays a significant role, requiring students to take part in service activities in the surrounding community, and they are expected to objectively analyze their work and progress on a regular basis. The MYP cumulates in the personal project, which is an opportunity for students to apply all of the understandings and skills they have developed throughout the programme in a personal task of their choosing. For more detailed information about the Middle Years Programme at NIST, download our prospectus. This document provides a complete overview of the curriculum, including our pedagogical approaches, assessment and more.